Randy's Layout Blog: The track gang showed up! In the picture you're looking (roughly) east. Of the two sidings in the foreground, the one on the left will be inside a building, the one on the right next to it. These tracks really should be a continuation of the two sidings seen entering the backdrop. Those two sidings are inside the rolling mill. In reality, there was a single track that went through the rolling mill and across Curtis Street. The very sharply curved track is the locomotive track for the Stanley Works HK Porter fireless 0-4-0. There is another industrial siding next to that one. 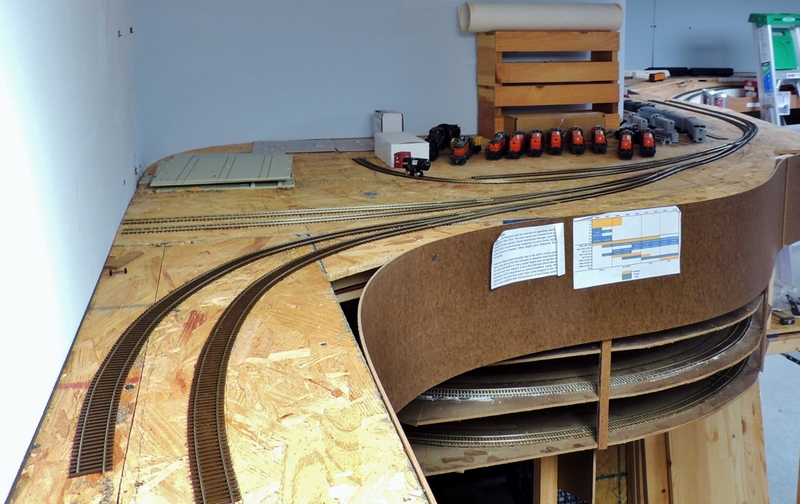 Just beyond the corner is a runaround, with the left track also serving as an industrial track. Just after these converge at the other end will be a gate and the end of the Stanley Works property. New Haven crews will drop off and pick up beyond that gate, and the Stanley Works crew will do all of the switching in the factory. There are a couple of missing tracks, but I think it will be enough for operations.